Youth Improv Summer Camp is ImprovBroadway's 5-day, interactive youth course that is great for young creatives looking for a fun theatrical skill to learn or improve this summer. The camp introduces the basics of comedic, theatrical improvisation. Students will learn how to use "yes and", play at the top of your intelligence, be active listeners, and use support moves to create comedic improvised scenes. At the end of the week, the students will perform a live, improv comedy show at the improvbroadway theater for their friends and family. Duration: 5 days, Monday through Friday, starting June 17th, 2019. 10 AM to 3 PM, with a 1-hour show on Friday (June 21st) from 5-6 PM. Class Requirements: Students must be willing to abide by ImprovBroadway's family-friendly content policy. To continue the camp in good standing students must arrive on time to each session, attend each class to completion, show respect and kindness to teachers and other students and maintain good hygiene. Students must bring their own lunches everyday. The teachers reserve the right to send students home, at their own discretion. Multiple infractions may lead to permanent expulsion from the camp. Disclaimer: Due to limited class size and the time-sensitive nature of the courses, all purchases are final and no refunds will be given. By registering, you agree to the behavioral policy and liability release listed on the Youth Improv Class page. Youth Improv 101 is ImprovBroadway's youth introductory course that is great for beginners or experienced improvisers. The class introduces the basics of comedic, theatrical improvisation. Students will learn how to use "yes and", play at the top of your intelligence, be active listeners, and use support moves to create comedic improvised scenes. Duration: Each course runs 5 weeks, once a week, for two hours a session. Class Requirements: Students must be willing to abide by ImprovBroadway's family-friendly content policy. To graduate each course, students must arrive on time to each session, attend each class to completion, maintain good hygiene, attend one ImprovBroadway show (students will be provided a complimentary ticket) within the duration of each course,. Pre-register for our next class. Pre-register here and be notified when the next one opens! Class times rotate, so if you can't make this round, chances are we'll hold a class your child will be able to attend eventually! Rebekah Price has performed improv with The Improvinators for the past 5 years. She graduated from ImprovBroadway's improv comedy school and completed the 501 course in musical style improv. She has performed in local theater productions with her favorite roles being Bakers Wife in “Into the Woods”, Sugar Plum Fairy in “Shrek the Musical”, and Gangster 2 in “The Drowsy Chaperone”. Rebekah frequently sings in her car and loves listening to standup. Shae McCombs is a graduate of the ImprovBroadway Improv Program and a current member of the MainStage Cast. She was recently featured on ImprovBroadway's TV show, "A Night at The ImprovBroadway" which will be released soon VidAngel. 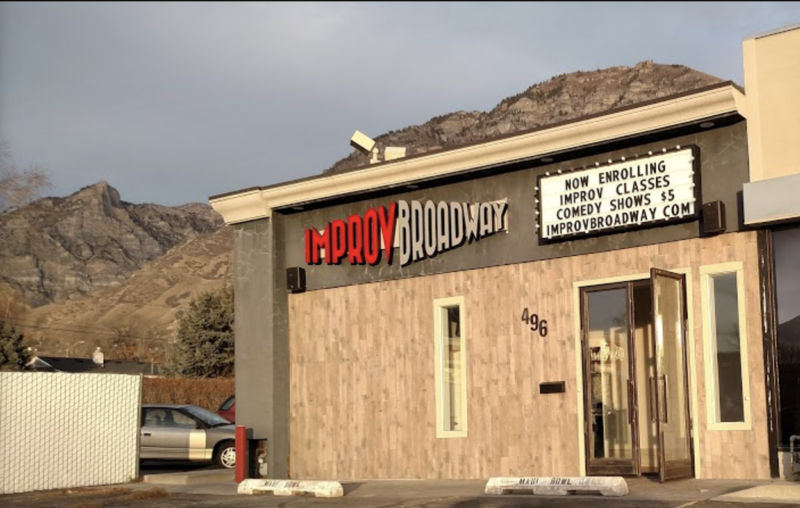 While we will certainly be working in a fun and relaxed environment, the ImprovBroadway Theatre expects all students to be on their best behavior. While we don't expect there to be any problems, whatsoever, it is important that we cover our bases so that the camp might be fun an safe for everyone. If, at any point during the class, the instructor finds that a student is being highly disruptive, inappropriate, or fears that the student will enact emotional or physical harm, the instructor will contact their parent or guardian and may require the student leave the class. If such behavior persists, a parent or guardian will be contacted and the student may be permanently expelled from the class. No refunds will be given should a student be asked to leave for bad behavior. NOTE: Please read this very carefully. All parents and participants must read and agree to these terms before registering for the camp. ​As a parent of a minor participant, I recognize and acknowledge that there are certain risks of physical injury associated with participation in this program, and I agree to assume the full risk for any injuries, damages or loss which may be sustained as a result of my minor child’s participation in the program as against the ImprovBroadway Theatre, it’s officers, agents, servants and employees. I do hereby fully release and discharge the ImprovBroadway Theatre and it’s officers, agents, servants and employees from any and all claims from injuries, damages or loss that may have or which may accrue to my minor child or me on account of my minor child’s participation in the program. I further agree to indemnify, hold harmless and defend the ImprovBroadway Theatre and it officers, agents, servants and employees from any and all claims resulting from injuries, damages and losses sustained by my minor child or me and arising out of connection with or in any way associated with the activities of the program (or with my minor child’s participation in the activities of the program). I have read and fully understand details provided to me and the Release and Hold Harmless Agreement. It is mutually understood that the digital registration document (including waiver and release of all claims) shall substitute for and have the same legal effect as the original form.